2.1. “The Commissioners” – means the Cowes (Isle of Wight) Harbour Commissioners. 2.2. “The Harbour” – The limits of the harbour within which the Commissioners exercise jurisdiction as a harbour authority and the powers of the harbour master are exercisable are the limits of the area within a line drawn from a parish boundary marker at 50°44.022’N 001°16.862’W by the north side of a public house called “The Folly” (on the eastern bank of the River Medina), thence on a bearing of 272 degrees to the western bank of that river to a position of 50°44.025’N 001°17.112’W, thence along the line of the High Water mark down the western bank of the River Medina and along the harbour to Cowes Castle, thence following the line of the High Water mark along the coast to a position in the vicinity of Egypt Point at 50°46.033’N 001°18.837’W, thence to a position in the vicinity of the northwest limit of the Cowes Fairway at 50°46.312’N 001°18.102’W, thence to a position in the vicinity of Prince Consort Buoy at 50°46.413’N 001°17.557’W, thence to a position 50°46.147’N 001°16.557’W, thence in a southerly direction to the shore in the vicinity of Old Castle Point at 50°45.970’N 001°16.557’W and thence along the line of the High Water mark on the eastern bank of the River Medina to a parish boundary marker at 50°44.022’N 001°16.862’W by the north side of a public house called “The Folly”, together with so much of the harbour premises as are not situated within that area (all coordinates in degrees, minutes and decimals of minutes and based on WGS 84 datum) (see figure 1). 2.3. “Outer Harbour” - means the area of the harbour as lies to the northward of a straight line drawn from Egypt Point to to Number 1 buoy thence to Number 2 buoy thence to the Shrape Beacon to Old Castle Point. 2.4. 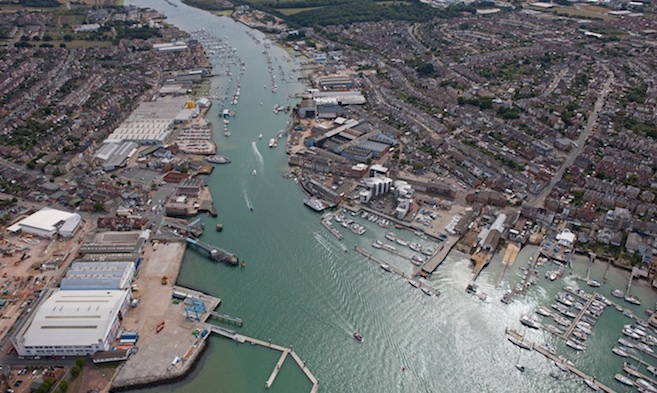 “Inner Harbour” - means the area of the harbour as lies to the southward of a straight line drawn from Egypt Point to Number 1 buoy thence to Number 2 buoy thence to the Shrape Beacon thence to Old Castle Point East Cowes. 2.5. 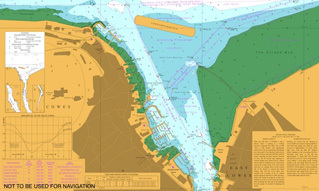 “Fairway” - means the navigable channel which is the regular course or track of vessels as shown on the Admiralty chart and by the navigation marks and buoys. 2.6. “Outer Fairway” - means the fairway as marked on the Admiralty charts, which extends approximately 500metres north from number 1 and 2 navigation buoys. 2.7. “Inner Fairway” - means the fairway located within the Inner Harbour. 2.8. 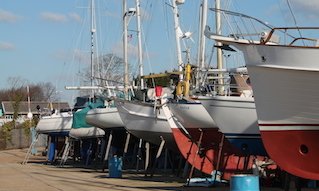 “Harbour Master” - means any person appointed as such by the Commissioners, and his deputies and assistants, and any other person or employee of the Commissioners for the time being authorised by the Commissioners to act, either generally or for a specific purpose, in the capacity of Harbour Master. 2.9. 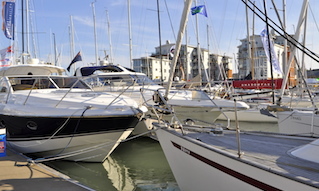 “Officer” – means any person authorised by the Commissioners, and may include the Harbour Master his deputies and assistants, and any other person or employee of the Commissioners for the time being authorised by the Commissioners to act, either generally or for a specific purpose, in the capacity of Harbour Master. 2.10. “Mean high water mark” - means the level of mean high water spring tides. 2.11. “Mean low water mark” - means the level of mean low water spring tides. 2.12. “Master” – when used in connection with a vessel means any individual, whether the owner or not, having or taking command, charge or management of the vessel for the time being. 2.13. 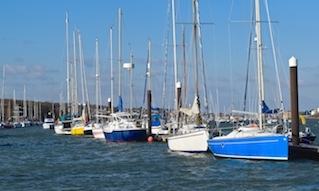 “Mooring” - includes any quay, buoy, pile, post, chain, pillar, pontoon or like apparatus or convenience provided or used for the mooring of vessels. 2.14. “Person” – References to a person shall include, where the context admits, companies or other entities. 2.15. “Underway” - when used in relation to a vessel means when it is not at anchor or moored or made fast to the shore or aground, and includes a vessel moving in the Harbour though its anchor is on the ground or seabed. 2.16. “Vessel” - means a ship, boat, raft or water craft of any description and includes non-displacement craft, personal watercraft, seaplanes and any other thing constructed or adapted for floating on or being submersed in water (whether permanently or temporarily) and a hovercraft or any other amphibious vehicle, used or being capable of being used as a means of recreation and/or transportation or commercial activity on water. 2.17. “Power driven vessel” - means any vessel which is driven wholly or partly by machinery. 2.18. “Sailing vessel” - means any vessel under sail providing that mechanical propulsion if fitted is not being used. 2.19. “Personal water craft” - means any vessel referred to as a jet ski, jet bike, wet bike, water scooter, fun craft or other similar description which a vessel is designed to carry a person or persons standing, kneeling, sitting or prone upon the vessel and which vessel is propelled by a water jet engine, the master of which vessel steers it with or without rudder at the stern by means of a handle bar operated linkage system. 2.20. “Wind surfing” - means the navigation or operation of a sailboard or windsurfer. 2.21. “Kite Surfing” – means the flying of a kite designed for the purpose of towing a person. 2.22. “Parascending” - means any activity wherein a person or persons are towed by or carried on a power driven vessel with the intention that the person or persons are towed or carried shall become airborne by virtue of their being harnessed to a kite parachute, balloon glider or similar apparatus. 2.23. “Chain Ferry” - means the tethered ferry operating across the river south of Trinity Wharf between Cowes and East Cowes. 2.24. “Fishing vessel” - means any vessel fishing with nets, lines, trawls, or other fishing apparatus which restrict manoeuvrability. 2.25. “Angling” - means the use of a rod and/or line for the purpose of fishing or crabbing. 2.26. “Swimming” - means a person in or entering the water without breathing apparatus and includes snorkelling. 2.27. “Towing of persons” - towing of persons means any activity wherein a person or persons are being towed behind a vessel with or without the aid of a flotation device or apparatus. 2.28. “Paddle boarding” - means the operation of a floatable board by means of lying, kneeling or standing using either hands or a paddle for propulsion. 2.29. “Spearfishing” - means to fish using a harpoon or trident either by hand or using a spear gun. 2.30. 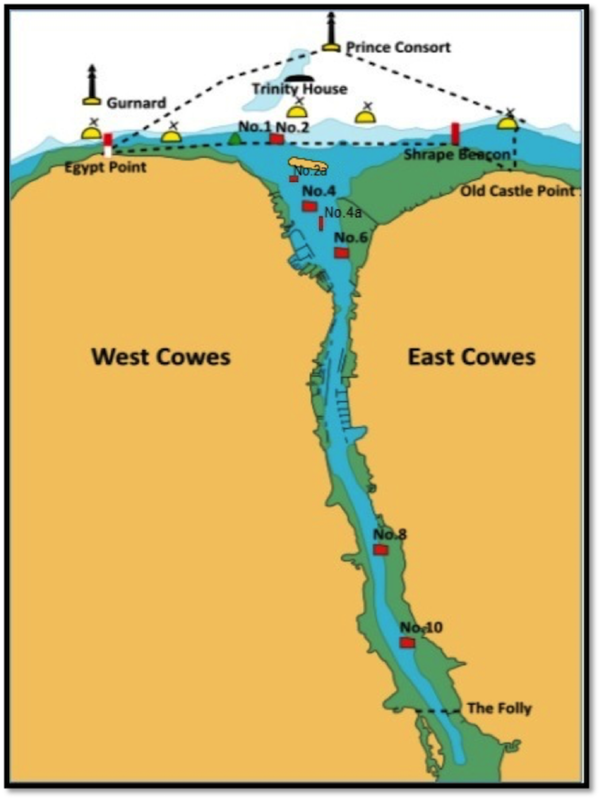 “Shrape Watersports Area” - means the area bounded by the shore to the south, the Shrape Breakwater to the west, the Small Craft Channel to the north and a line joining the Shrape Beacon and Old Castle Point in the east. 2.31. “Grounded” - means a vessel that unintentionally makes significant contact with the seabed but does not include incidents of minor touching of the seabed where no damage to the vessels watertight integrity occurs.